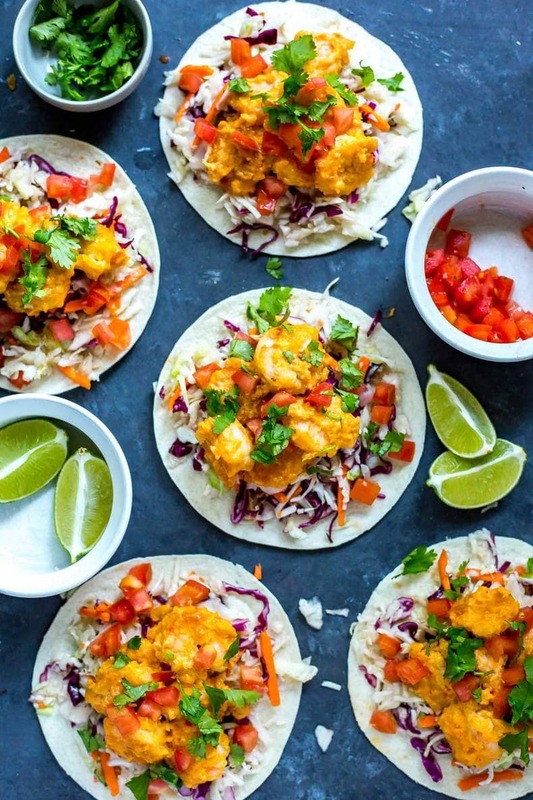 These Bang Bang Shrimp Tacos are a healthier version of the Bonefish Grill favourite – you're gonna have these tacos on repeat, trust me! 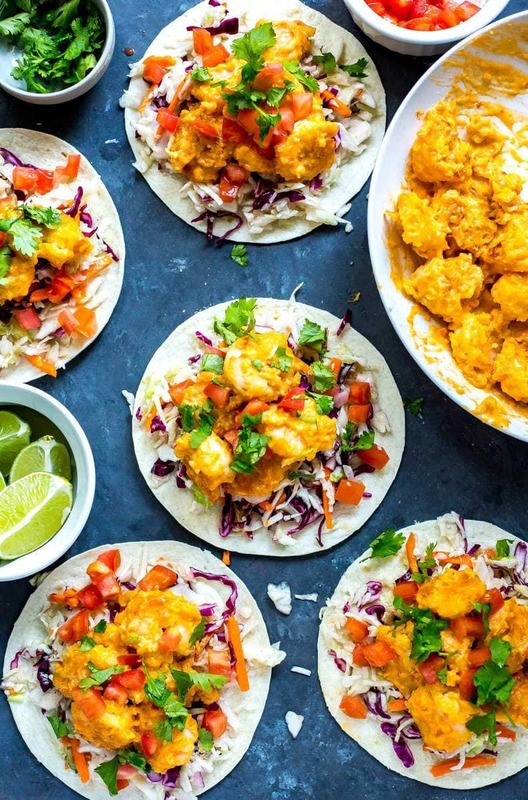 THESE BANG BANG SHRIMP TACOS PEOPLE! These are a glorious new discovery of mine. Now Americans and Canadians alike, let me tell you about the magic of Bonefish Grill. The first time I ever ate at the American seafood chain was in Myrtle Beach on a family vacation a few years back, and as a general seafood hater (I know!!! ), let's just say I was not looking forward to the dining experience. While I typically dislike fish, I do like shellfish (umm hello, SCALLOP TACOS). I'm drooling already and it's like 8 in the morning as I'm typing this LOL! 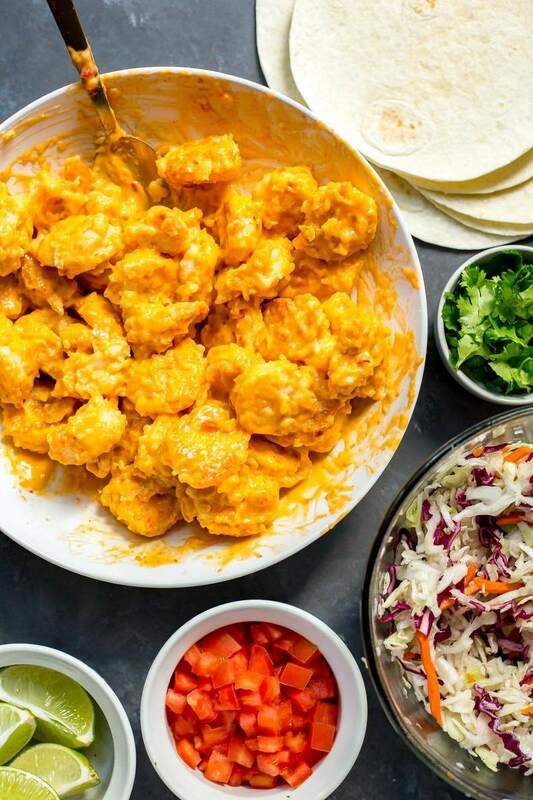 Given my love of Bang Bang Shrimp, you can imagine my despair at not having Bonefish Grill in Canada. But where there's struggle and hardship, there's always a silver lining. The sauce – it's SO easy! Honestly, anyone could make it. The secret? A little bit of mayo, sweet chili sauce and sriracha all mixed together. Yep, just three ingredients. It doesn't get any easier than that! I've seen a bunch of recipes that recommend deep-frying the shrimp and as someone who's more fixated on eating healthy but still enjoying my favourite foods, I thought I would make a slightly lighter version of the kind you get at Bonefish Grill. No heavy batters, not a ton of oil and some light mayo make these a healthier taco but still keep the flavour. I've added a quick coleslaw too because that really brings out the flavour of the shrimp but if you're feeling lazy you could just use some chopped up romaine lettuce. Just be sure to use the real corn tortillas for an authentic taco flavour and maybe throw in a bit more Bang Bang sauce. It can't hurt. 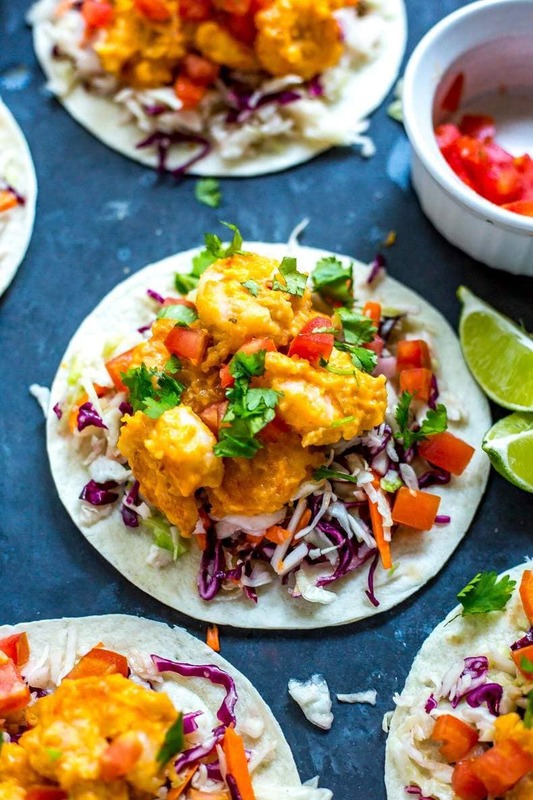 You're gonna want to eat these Bang Bang Shrimp Tacos for lunch, dinner, weeknights, weekends, whenever! If you've got 30 minutes, you've got yourself a delicious restaurant copy cat without even having to leave your house! While I *THINK* these are hands down my favourite taco recipe on my blog, these Kalbi Beef Tacos are a close second so if you're not quite into shrimp I do have lots of alternatives for you. I think my love of tacos comes from multiple family vacations where it was an absolute MUST to stop at at least one Mexican restaurant – whether we were in North Carolina, Virginia, Vancouver or Halifax, we were always on the lookout for tacos, enchiladas and the like. Secretly, I think my parents just wanted an excuse to drink a ton of margaritas. Oh, the things I was ignorant of as a kid lol! Even at home, tacos became the “fun meal” we would have quite often on a Friday night and honestly, I've tended to carry on the tradition as an adult. They're relatively healthy and hardly even considered a cheat meal, but they taste just as good as one. I highly recommend that you serve these on corn tortillas (they usually go one sale every couple of months at your local grocery store – I buy them in bulk then freeze them! ), and I also think you should just go crazy and get a huge pile of guac and pico de gallo to go with them. But these are suggestions only – they're your tacos after all! 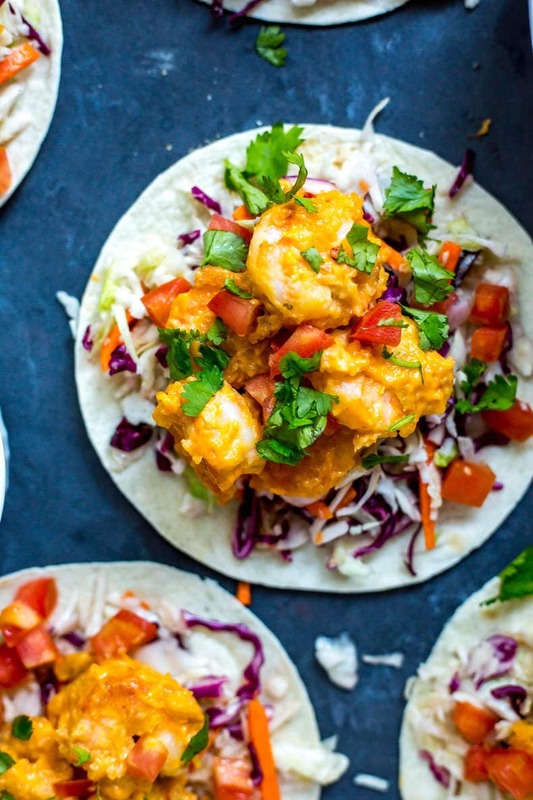 Will you be trying these Bang Bang Shrimp Tacos? 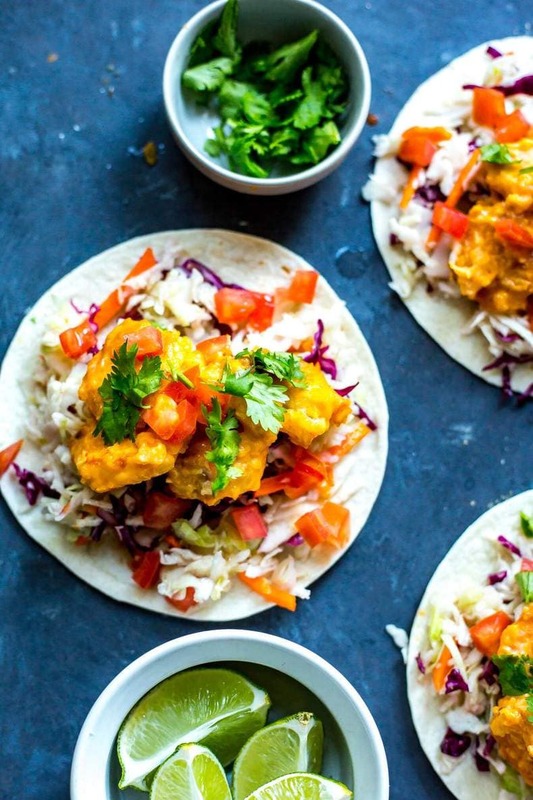 You're seriously gonna have these tacos on repeat all year long! I can't even deal with how tasty these are – they're the perfect weekend meal so if you feel yourself coming to the end of the week and looking forward to eating ALL the junk food, think again! Tacos on repeat! If you try any of my recipes be sure to let me know in the comments, on Instagram, Twitter or Facebook – I’d love to see what you're cooking up! I loooooove these corn tortillas and really they are the only way you should make these tacos! Mix together coleslaw and pico de gallo, then let sit for flavours to mingle. Mix light mayo, sweet chili sauce and sriracha together. Set aside as the Bang Bang sauce. Heat olive oil in a large frying pan over med-high heat. Toss shrimp in egg then coat in flour, then fry for 2-3 min per side until shrimp are crispy. Remove shrimp and let drain on a paper towel lined plate. Toss in Bang Bang sauce until well-coated. Oooh these looks do colourful and delicious and amazing! 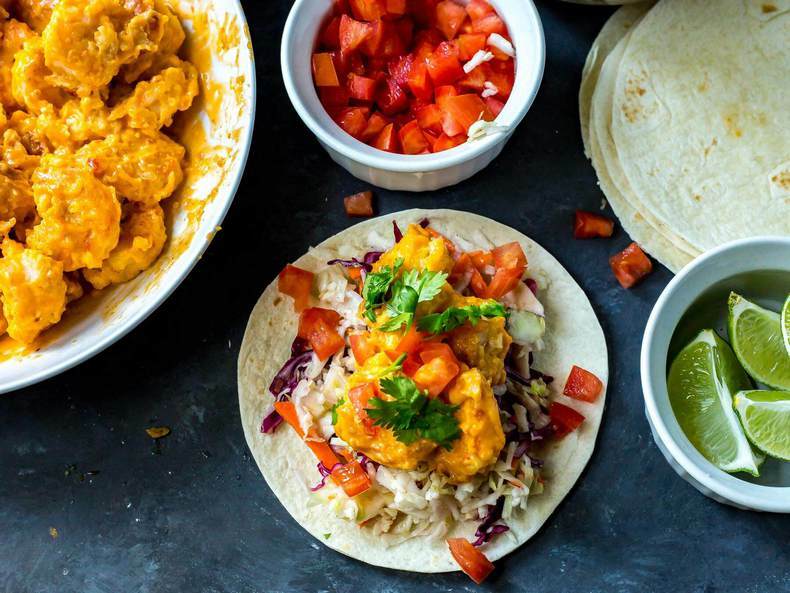 Having never visited the States, I haven’t been to a Bonefish Grill, but I can certainly appreciate awesome looking Tacos like these (I mean, it’s TACOS!!!!). I made these tonight and I had to come back and tell you these bang bang toacos are amazing and very easy. This was restaurant worthy right in my kitchen. Thank you for the recipe! I’m so happy to hear that Alissa!!! So disappointed! I cannot print your recipes at all. Says website unsafe and has been blocked. Your recipes look so good! HELP! Sorry to hear this has been an issue Lisa – it could just be your anti-virus…maybe it needs updating? I’m able to print the recipes just fine without that warning so it’s very strange this is happening to you! Hi! I have a suggestion – try to copy the recipe and paste it into a Word document or such. That’s how I do it because I like to have a picture with my recipe printouts. Does the coleslaw save well in the fridge/do you think I could make it 24 hours in advance? Hey Alex – you should definitely be able to make it 24 hours in advance. I wouldn’t make it any further in advance but 1 day should be ok!